Jan 20, 2017: Any scale recommendations on Amazon? Jan 22, 2017: DAE completely not trust their scale ? Jan 29, 2017: Value of a scale? Apr 18, 2017: Daily Q&amp;A Post - No question too small! 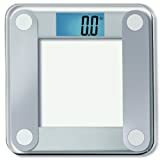 Jan 19, 2018: Eagerly awaiting Amazon to deliver my new scale! Apr 17, 2018: Scale keeps jumping around in its reading. Oct 31, 2018: Daily Q&amp;A Post for Tuesday, 30 October 2018 - No question too small!